· The smiles and greetings at the school gates before and after school. I am indeed privileged to be leading such a community and I look forward to the many opportunities to work together to develop and improve our school. There are several ways you can contribute to our school’s future direction and improvement processes. The staff have spent many hours researching and drafting a Vision For Learning, K-Year 6, for our students and we will be seeking your feedback. Vision for Learning Workshops will be held Week 1, Thursday 2 May after drop off 9.00 am, before pickup 1.45 pm and an evening session at 6pm. All of these workshops will be held in the Multi Purpose Hall. 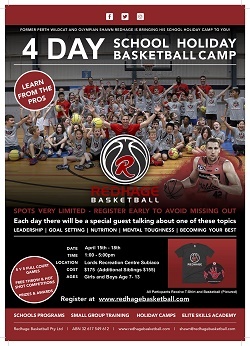 All you need to be a part of these hour long sessions is an interest in your child’s education. The School Board has already met to begin the process for our school strategic plan. Parent, Staff, Student and Parish workshops will be held throughout the month of May. Please keep the 23rd May free to join us at either 9.00 am, 1.00 pm or 6.00 pm for a 90 minute workshop on where you would like to see our school in years to come. We are reaping the benefit of previous community involvement in strategic planning and I look forward to your contribution to our future generations. My thanks to those parents who have nominated to be a part of the Learning Teams for Health and Wellbeing, Information Technology and Evangelization. 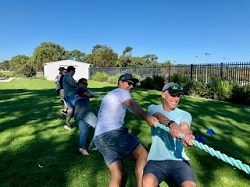 I’ll confirm those teams early next term so there is still time to register your interest, further information can be sent on request to Vicki Ryan at admin@olg.edu.au. The Easter Season is a time of reflection, waiting and eventual joy at the Risen Christ. These times in our Liturgical calendar are opportunities to reconnect with our faith and with each other. I wish you all a wonderful Easter and hope that you find time to celebrate this time with both your immediate and Parish family. On Friday the 5th of April our Year 4 students went on the most thrilling excursion! 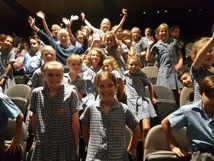 We went to Newman College Marist Auditorium to see the musical play of Masquerade. The story of how the Moon fell in love with the Sun. It was awesome! Jack the hare had a fantastic, funny and terrific adventure with new friends and new enemies. As Jack Hare had to deliver a jewel to the Sun but there were ups and downs and it was so cool for all the Year 4’s to be invited along. You should definitely see the play! There were some riddles as well. The main one was: ‘Fifty is my first, nothing is my second, five just makes my third, fourth a vowel is reckoned. To find my name fit my parts together, I die if I get cold but never fear cold weather. Can you figure it out? 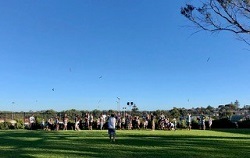 We have had a big term 1 of P & F events. Thanks to all our event leads and volunteers for giving their valuable time and special efforts to make all our events a success! We welcome any feedback which helps us to improve and make our events even better. Please email any feedback or suggestions to exec@olgpf.com. 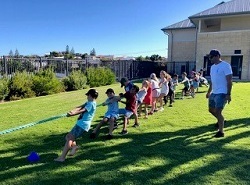 Despite the windy weather, all the kids had a ball at Friday afternoons Easter Family Fun night. Well done to Amanda and her helpers for organising the music, balloon twister, face painter and pizza van. 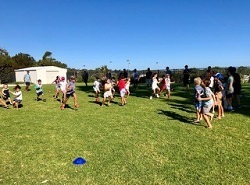 Thanks to all the families that came along to enjoy a friendly afternoon together. 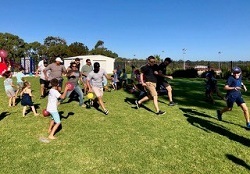 A BIG THANK YOU to all the dads for making a special effort to bring along their kids last Sunday for an afternoon of being active, teamwork, creativity and having FUN! 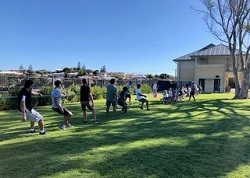 Everyone participated in the spirit of The Fathering Project where all dads and father figures spent some quality time playing with their kids and providing some positive role modelling. 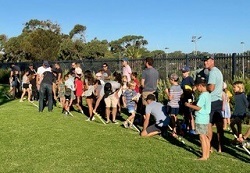 It was also great to see dads across all our year groups get to know each other and build on strengthening our OLG community. We welcome any feedback and suggestions for future events and encourage all dads to be part of this very important OLG initiative. 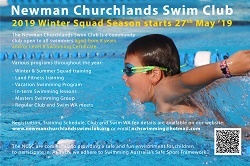 Special thanks to Damien Newbold and Dan Cassetai for helping to organise this event. 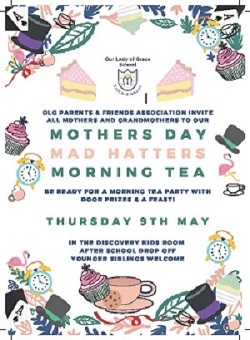 Inviting all mothers and grandmothers to celebrate Mothers Day at our Mad Hatters Tea Party! 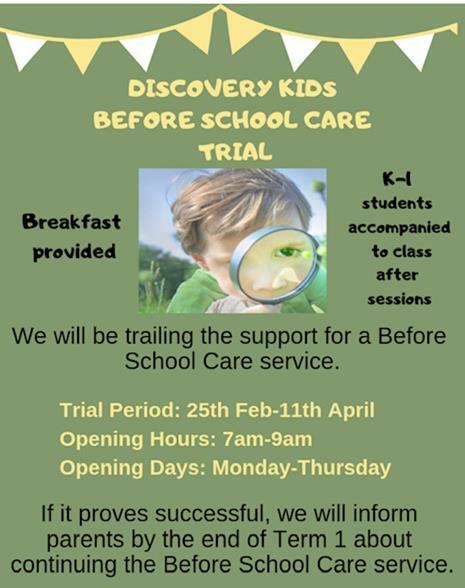 Thursday 9th May held in the Discovery Kids Centre after school drop off. Door prizes and a feast provided. Younger siblings are more than welcome. Wishing all our families a happy Easter and safe school holiday break. WALKATHON – winners are near! Thank you to everyone who bought in their Easter eggs and gifts for our Easter Egg Hampers. We made up Easter Baskets for Saint Vincent de Paul, Easter Eggs were delivered to Trinity Village and baskets were given out to our community. You have all helped to make lots of families very happy at Easter time. A big thank you to our volunteers, for helping make up the baskets, and for delivering them to Saint Vincent de Paul. A special thanks to Peta Taylor, Linda D’Vas, Kate Selth and Tracey Retamal. Well done to all teams that participated in finals and round robin games this week. Best of luck to our teams that made the Finals this week ! WELCOMING Green Leaf Pharmacy on board as our first extended partner taking up a Gold Sponsorship in our OLG Business Community. After personally meeting Stuart, I experienced a genuine local business owner who wants to support our school and provide trusted advice in keeping our families healthy. Green Leaf Pharmacy North Beach is located within North Beach Shopping Centre and is open 7 days a week, 7am until 8pm, including public holidays and over the Easter long weekend. Whether it be for your health needs, fitness needs or lifestyle needs Green Leaf pharmacy has got you covered. 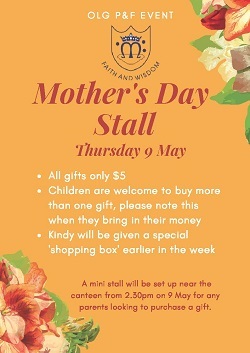 Also stocking many Easter gifts which are not chocolate. With free gift wrapping of any purchase and the latest Hallmark and $1 cards, they are your one stop gift destination. Come down and see Stu, Jess and the crew during the holiday break, and let them join you up to their free and cardless loyalty club and receive $1 credit for every $15 you spend (excluding Prescriptions, Lotterywest products and ePay purchases). Green Leaf Pharmacy is proud to be supporting Our Lady of Grace in 2019 and beyond. 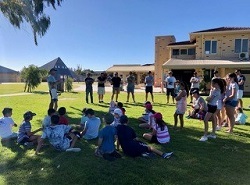 For over 110 years, Aranmore Catholic College has offered a rich educational experience, underpinned by traditional values in a safe and supportive environment. Visit us on Open Morning and discover the broad curriculum and vast extra-curricular opportunities on offer. 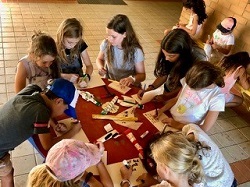 Fire Tech offer innovative and interactive workshops for curious young kids through to savvy teens. We help shift kids from being passive consumers of technology, to developers and producers of digital tech with real-life application. 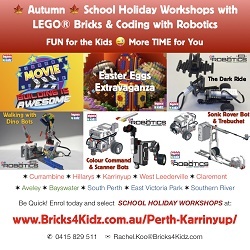 Fire Tech is Perth’s leading provider of creative and technical STEAM workshops covering areas such as coding, building and flying drones, mastering Minecraft, animation, and more! The workshops are available for three age groups (6-9, 9-12 and 12-17 years) – and you don’t have to be a student at Christ Church Grammar School to attend. More information, prices, booking information and workshop dates and times at firetech.wa.edu.au. Enter the code CCGST1 at checkout for a 10% discount.